Home / Giveaways / Eco Cups Coffee Giveaway! Love coffee? Love the environment? Do you worry about the waste of KCups? 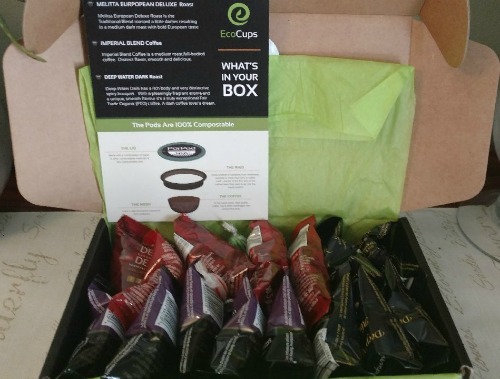 EcoCups, a coffee subscription service is serving up guilt free KCups. Their Coffee Pods are guilt free because they are 100% compostable. Have EcoCups delivered directly to your home, office or a special someone as a gift. When you sign up for the subscription box service you’ll receive an assortment of gourmet coffee, that allows you to taste coffee blends from around the world. This is a great way to introduce yourself to new flavors. Why subscribe to EcoCups? Because every month you know you’re coffee reserves are being refilled, you are getting a good product with great flavors, you get to try something new, and most of all? Because this is a better product for the environment. Even the smallest things we do to help our environment is a step in the right direction! Disclosure: The bloggers participating in this event have NOT been compensated for this post. Networking Perks provides honest opinions, beliefs or experiences on products reviewed. Networking Perks is NOT responsible for prize fulfillment, EcoCups will be sending the prize directly to the winner. This event is in no way associated with, sponsored, administered, or endorsed by Twitter, Google, Pinterest, Facebook or any other social media. If you have any questions or would like help in promoting your own product please contact me at Joie@NetworkingPerks.com . The disclosure is done in accordance with the Federal Trade Commission 10 CFR, Part 255 Guides concerning the use of Endorsements and Testimonials in Advertising. I love that they’re 100% compostable single serve coffee pods. This is the first time I see compostable pods. I like that their coffee pods are 100% compostable. I love that you can pick the coffee package you want and you can cancel at anytime. I like the 3 month prepay package myself.